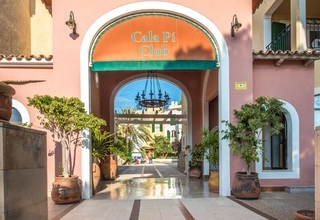 This club resort is a magnificent apartment complex located in a privileged area in southwest Mallorca. IT is just a 15-minute drive from Lluchmajor and 20 minutes from S'Arenal de Lluchmajor and the tourist centre. Guests who fancy spending a more active stay can visit Palma de Mallorca and enjoy shopping, visiting the sights or savouring a drink and exploring the island's capital. This residence lies only 30 minutes from Palma and is just 20 minutes' drive from Palma de Mallorca Airport. The complex is constructed in the form of an ?S' and consists of a garden, a terrace and several apartment blocks overlooking the sea or the pine forests. The salmon and terracotta colours give warmth to this Mediterranean-style complex. This charming apartment hotel comprises a total of 118 apartments, all of which are fitted with every modern-day convenience guests will need.